Levers are often fine as door handles, but sometimes a door knob can give a door an extra sense of class, whether you’re going for an antique or modern look. We have a large range of widely varying knob furniture for sale. These are either rim knob sets or mortice knobs, with some models usable for either system, and their designs vary immensely, from ornate antique styles to a sleek modern look. Many are made entirely of metals, including the From the Anvil Antique Brass Beehive Mortice/Rim Knob Set and the Set Fulton & Bray Satin Chrome Concealed Fix Flower Mortice Knob, with other models made of iron, pewter, bronze and stainless steel. We also stock a wide selection of knob furniture made of wood, glass or porcelain, with metal rims or mortices. These range from the From the Anvil Rosewood Ringed Mortice/Rim Knob Set to the Set Fulton & Bray 50mm Bubbled Glass Ball Mortice Knob. We also offer knobs on rose backplates, such as the Beamish Pewter Door Knob on Jesmond rose backplate. 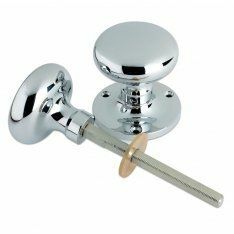 If knob furniture isn’t what you want, we also offer a wide choice of lever furniture on a backplate or lever handles on rose, including a selection of Italian Swarovski crystal door levers, as well as a range of escutcheons and snib and release options. For those who want a stylish door handle that can be fitted quickly with a minimum of fuss, HOPPE quick fit door levers use HOPPE’s world-famous system.